Cast Iron Effect Deepflow Gutter has a higher capacity and flow rate than standard half round, therefore this gutter system is ideal for those looking for the appearance of a traditional cast iron gutter but with all the benefits of a Deepflow PVC system. The mottled finish that so closely resembles the original cast iron gutters of times gone by as achieved using a patented paint application which is applied in the factory once the manufacturing process is complete. 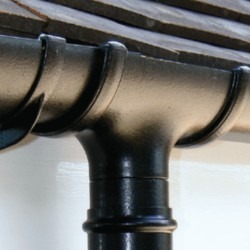 Cast Iron Effect is now one of the most popular styles of all guttering finishes. The deepflow gutter connects to circular downpipe using a running outlet. 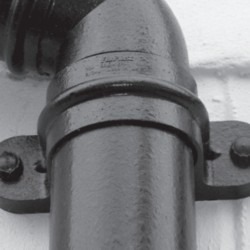 Unlike standard colour circular downpipe fittings, the cast iron effect versions are decorative and feature raised mouldings and fixings lugs along with wider pipe clips and a choice of decorative hoppers. These features add interest as to the installation as well as functionality, making cast iron gutter and pipe a stand-out feature that has a completely different appearance to normal gutter systems.